Linus Torvalds is big on distributed version control (http://lwn.net/Articles/246381/), and I’m starting to see the light. Distributed version control is something any organization should seriously consider, not just open source projects. This is a start of a series of blog entries that shows my progression of version control preferences and the advantages of each. 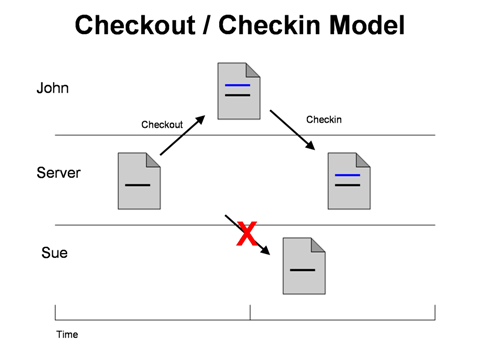 Checkin/checkout solves the main issue: Multiple developers working on the same body of source code. Developers check out a file, and no one else can edit it. Once the developer is done, they check it in and someone else can edit it. Easy. Simple. Everyone understands how it works. A lot of Microsoft shops historically preferred this model for many reasons, but one is because Source Safe works this way. Source Safe can handle shared checkouts (which is very similar to the Update/Commit model), however anyone who has used it will tell you that shared checkouts in Source Safe will go wrong eventually. It is unfortunate that shared checkouts have scared many people away from the Update/Commit model, because the Update/Commit model has advantages over the Checkin/Checkout model when done right, for instance in Team System. My reality has been changed forever because of you. This writing style reminds me of my roomate back in Illinois. But not everyone is good at being both creative and still being detail oriented. I love the helpful information you give in your posts. You really deserve a big kiss right now.